You’d like to experience the Nuki Smart Lock and get to know the latest news? 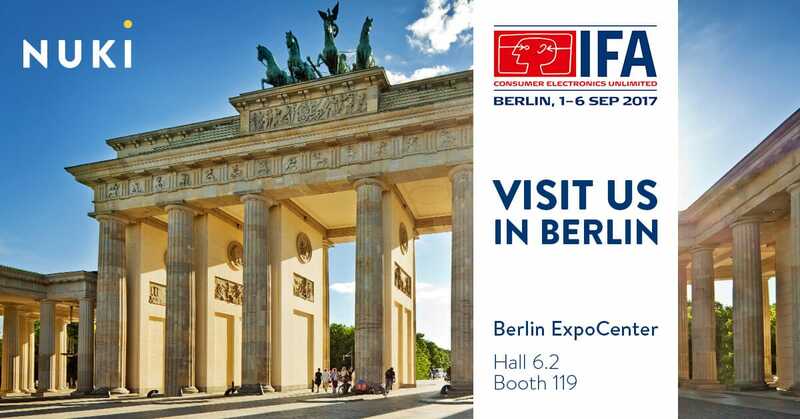 Visit us at the IFA in Berlin (Hall 6.2, Booth 119) and discover how your live gets smarter with an electronic door lock! Keyless into your apartment building ? Since the very beginning, it’s our philosophy to make access controls smarter and physical keys irrelevant. With the Nuki Smart Lock we have already succeeded very well, we think. But as we know, many of you live in apartment buildings. Thus we are very happy to present you a smart solution for this case as well, at the IFA 2017! Stay tuned and get all the information directly at our booth. Update about the Swiss Round Cylinder ?? Good news for our friends from Switzerland! With the beginning of the IFA we will also launch the Nuki Smart Lock version for Swiss Round Cylinders. You will be able to choose the respective version at the product page in the Nuki Shop. Global Smart Home Integration ? As a third innovation, we will present another interesting Smart Home integration for your Smart Lock at the IFA. But for now the details will remain our little secret. ? We would be delighted to welcome you personally at our booth and discuss the future of smart living with you. PS: Feel free to subscribe to our Facebook event to get an reminder to visit us at the IFA.